Everyone knows that Apollo 11 commander Neil A. Armstrong was the first human to set foot on the Moon (and if you didn’t know, that occurred on July 20, 1969 – yes, it really happened). It was a momentous, history-making event that many (like myself) consider one of the most impressive achievements of humankind. But oddly enough, even with high-resolution Hasselblad film cameras there on location, there are very few photos showing Armstrong himself on the surface of the Moon. 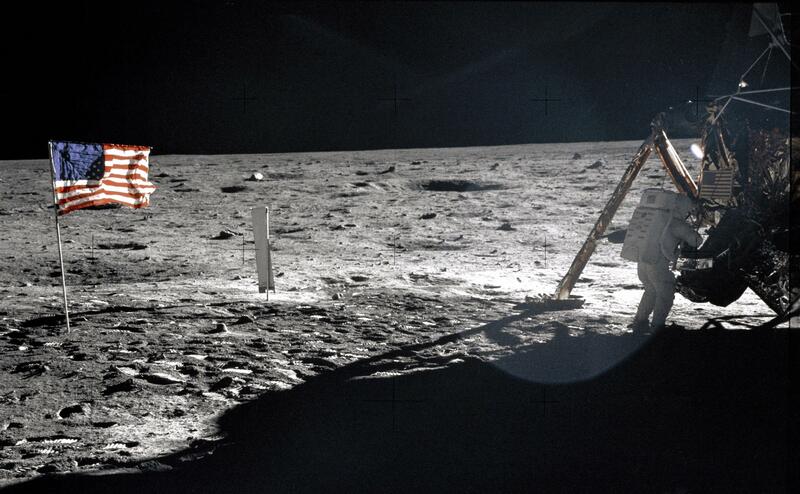 In fact the one above, a panorama captured by fellow Apollo 11 astronaut Buzz Aldrin, really is the best image in existence of Neil on the Moon. Don’t put on your aluminum foil conspiracy hats just yet. As it turns out, of the two-man moonwalking team Neil Armstrong was just the one taking most of the photos. 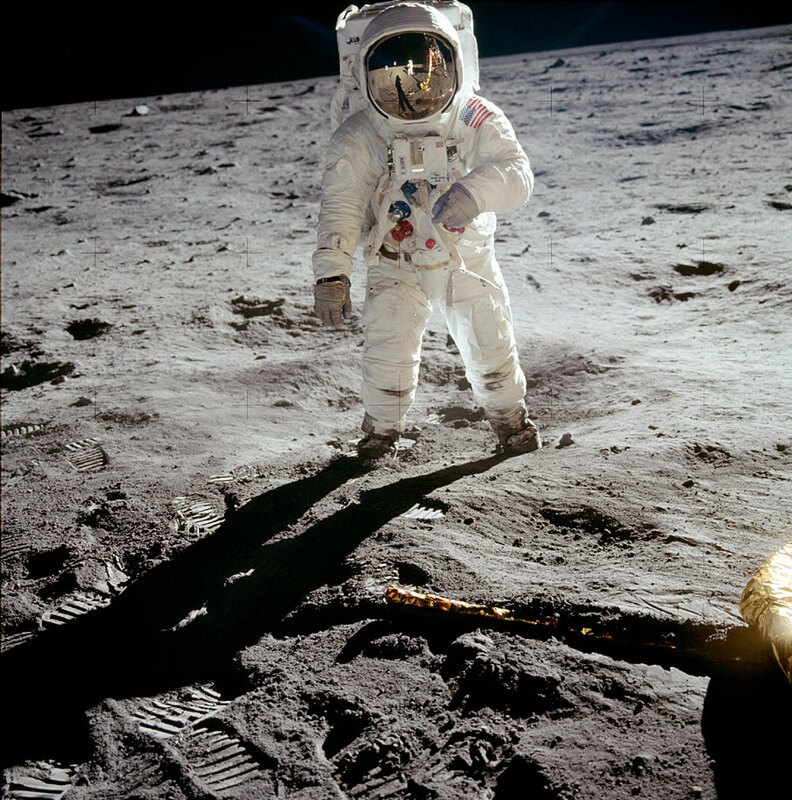 Even the famous photograph that for decades has epitomized the Apollo 11 moonwalk is of Buzz, not Neil. Neil took the photo, and he can be seen reflected oh-so-tiny in the center of Buzz’s visor. Because their amount of time on the lunar surface was limited – and it’s NASA – every moment of the two astronauts’ two-and-a-half-hour EVA was meticulously plotted out. It simply wasn’t Buzz’s job to take the portraits. The video below, made from color footage captured by a 35mm film camera mounted to the LM, shows Armstrong collecting samples near the LM. Although not individually high-quality photos like the sort taken by the medium-format Hasselblads, you can make out his face in his helmet for a brief moment as he had his glare visor raised. If you want to see lots more photos from the Apollo 11 and other Apollo missions, I suggest checking out the Project Apollo Image Archive here. Happy Moon Day, and don’t forget to give a wink for Neil! Interesting information! I hadn’t really thought about that but these are some neat images. And, at the end of the day, anybody who has read about or even lucky enough to meet him (not me, unfortunately), Neil was humble enough to have wanted it that way anyway. There was no shred of ego or importance about him (from his viewpoint). Thanks for sharing your post. Very informative. As humans we tend to overlook many things.